Questions about the the Chicago Police Department's crime recording practices and categorization of homicides have been hot topics since Chicago magazine and the city's inspector general published critical reports on April 7. Two resolutions calling for hearings with testimony by the inspector general and Police Superintendent Garry McCarthy were introduced at yesterday's city council meeting. 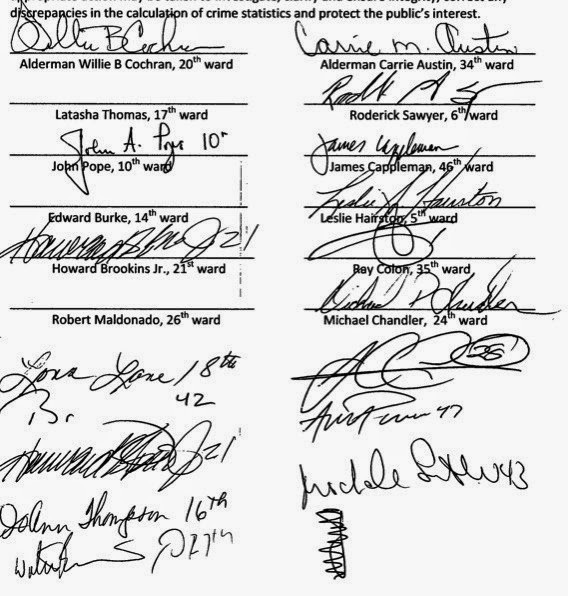 One resolution has six signatures, including Alderman Scott Waguespack's. He represents a large part of Lakeview directly west of our 44th ward. The other resolution (PDF) has not received any press, but it does have a whopping sixteen signatures, including those of Lakeview/Uptown's James Cappleman, Lincoln Park's Michele Smith, and Ameya Pawar of Lakeview/North Center. Missing in action on both resolutions is Wrigleyville and Boystown's alderman, Tom Tunney. We asked his office why he wasn't a part of either action. Answer: He wasn't asked to sign, but he has set a "goal" to sign one. There was a full docket at the City Council meeting yesterday and the sponsors of these resolutions did not bring them to my attention nor request my support. I believe these are admirable resolutions and my staff and I are researching both of them. At first glance they look very similar but will be heard in different committees. It is my goal to sign on to the resolution that will be addressed in the most expeditious manner. The accuracy of crime classification and reporting practices by the Chicago Police Department is a critical issue, and it needs to be publicly addressed by Superintendent McCarthy. We recommend achieving that goal in short order. Part two of Chicago magazine's report is on the way.